I’m currently at Google Cloud Next ’18 avidly following the Google Apps Script and education related sessions, which I’ll try and capture in this tag. We’re bringing the collaborative capabilities of Google Docs and Drive to Learning Management Systems through the Learning Tools Interoperability standard. The toolkit will include an assignment tool which allows instructors to create and grade assignments using Google Docs within their LMS, as well as file embed tool to embed Google Drive files. Course Kit is designed to remove some of the main points if instructors what to integrate Google Docs as part of assessments. With the LTI integration teachers don’t have to leave their VLE, being able to setup the assignment. Course Kit also extends the build-in functionality of Google Docs. At submission the learner is removed as an owner of the Google Doc but a copy of their submission is automatically copied to the students Google Drive. To easily move between submissions at the top of each Google Doc is a student dropdown switcher. One of the biggest features is the modification to the existing Google Docs comments feature which enables you to quickly use a bank of canned feedback responses. This can either be used by starting a comment with a ‘#’ and typing a term which populates an autocomplete list. The feedback bank can be added to as you type or you can bulk import an existing list. Feedback comments can also we added from the sidebar. Whilst the Google Doc is being graded the usual comment email notifications are disabled so the learner won’t see draft comments until the assignment is returned. 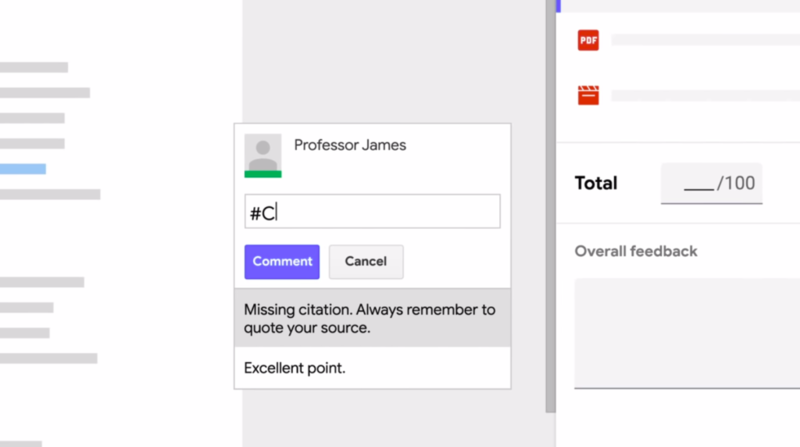 As well as adding feedback to the Google Doc you can add a grade and any final comment. When the teacher returns the Google Doc to the student they are returned as an owner and this time a copy of the document with the feedback comments.